Share the post "Big Chicken Pot Pie"
I love baking to keep the house warm. So when it’s cold out we do a lot of baking! And nothing says comfort food like chicken pot pie. Get out a pie plate, we used a glass one, 10 inch. you will need 2 pie crusts. Put one on bottom of pie plate. Cook 3 chicken breast, cut up breast. 16ounce bag of mixed medley veggies. (Corn, carrots, peas, broccoli, cauliflower, squash) Simmer in skillet with one jar (12oz.) chicken gravy, and 6-8 ounces of chicken broth, season with salt, pepper, garlic powder and basil. 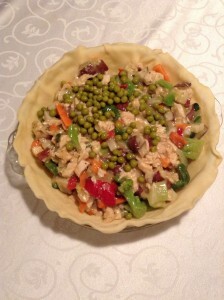 Mix with chicken, pour into pie crust. Cover with second pie crust, make approximately 6 or 7 slits in top of crust, bake at 375 degrees for 40 minutes.